2013 Road Trip Notes, Day 7: Signs of Life Before the Internet « Midlife Crisis Crossover! Some roadside attractions don’t look like attractions unless you arrive properly informed and prepared to conduct an exhaustive, block-by-block search for the attraction in question, sometimes navigating around unexpected special events, poor road signage, streets that change name every 2-3 blocks, unwelcome construction zones, major Mapquest malfunctions, or our own distracting misconceptions. The way of the road-trip warrior can be a daily obstacle course whose reward is valuable only if you think it’s valuable. Internet magic now provides travelers with amazing tools for hunting assorted ephemera and oddities stationed in thousands of locations nationwide. We have road-trip networking sites for swapping firsthand knowledge and scavenger-hunt tips, third-party travel-advisory sites that have no vested interest in steering users solely to corporate-sponsored activities, apps for virtual road mapping, and smartphones to access all of the above on the go, provided you’re in a handy 4G coverage area and aren’t tracking the World’s Biggest Ball of Sawdust in some remote Amish mountain enclave. Some searches prove fruitful. Exhibit A, shown above: the last original tower remaining from the experiments of Guglielmo Marconi to study the potential for moving objects to receive radio signals. 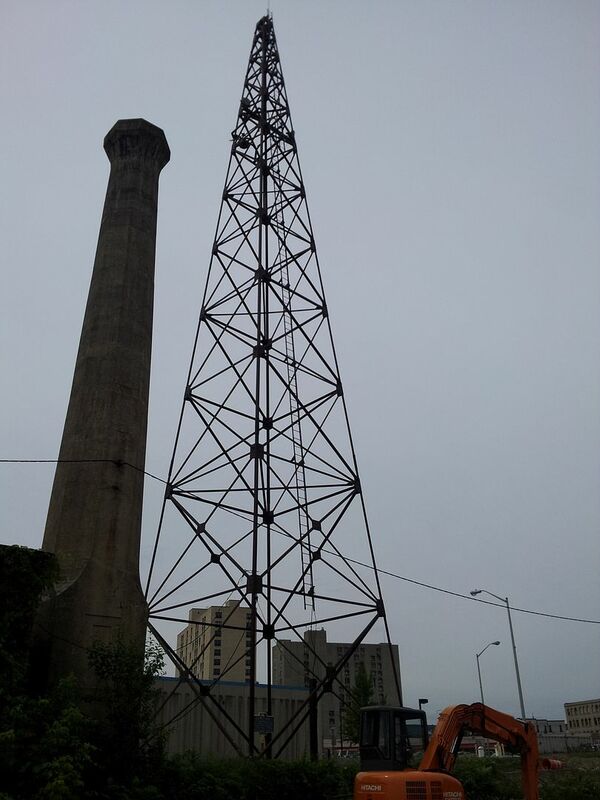 Marconi’s work with these towers, built to his specs in 1913, would pave the way for wireless communication as we know it today. A full century later this lone tower remains standing in Binghamton, New York, decades after the others were demolished. Important stepping stones such as this were vital to our technological history, especially the part where we can now yammer back and forth at each other across the Internet on the tiniest of unplugged devices. Thanks to the good folks at Roadside America, we were able to pinpoint the tower’s location without pestering any locals for directions. One minor snag: several blocks of downtown Binghamton were cordoned this weekend for their annual July Fair. After a few improvised turns and several minutes manually mapping the terrain like a video-game character in an unfamiliar dungeon, I was able to chart a course to the tower despite the craft booths and fried-food stands that Google Maps refused to show us. Sometimes our searches are stymied in other unavoidable ways. While in Binghamton we’d also hoped to see an exhibit of artifacts from the life of writer Rod Serling, creator of The Twilight Zone. All research — including one piece only three months old — pointed us to the exhibit’s permanent home in the lobby of the Forum Theatre. Alas, upon our arrival the two ladies at the box office regretted to inform us that the exhibit had been removed, its new whereabouts unknown to them. These things happen. We thanked them for their time and decided not to express our disappointment in the form of property destruction. This sort of unexpected failure doesn’t keep us down for long. In our annual road trips, if one attraction should fall, two more shall arise to take its place in our memories, whether they’re items we discovered online or pleasant surprises we discover on our own through the lost art of wireless random wandering. I’ve been to Binghamton many times. Nice place to visit. Wouldn’t want to live there. To be honest, I think you’ve summed it up well.